Top 10 Things that made me Smile | House Unseen. Life Unscripted. He's five and has recently taken to yelling every. single. thing. he says. I DON'T KNOW WHERE HE COULD HAVE POSSIBLY LEARNED SUCH BEHAVIOR. 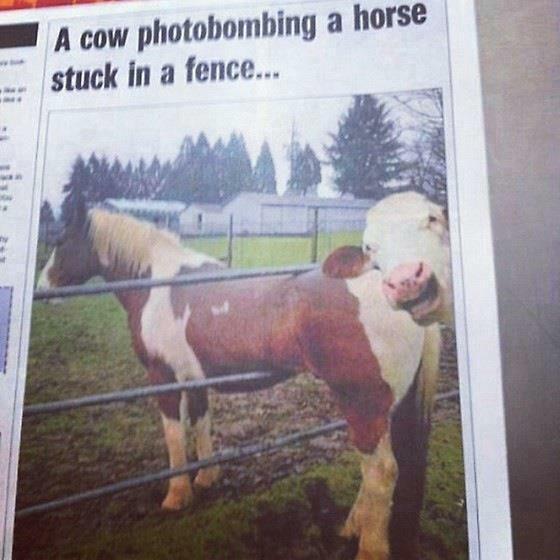 This ridonkulous cow photobomb. 'Nuf said. 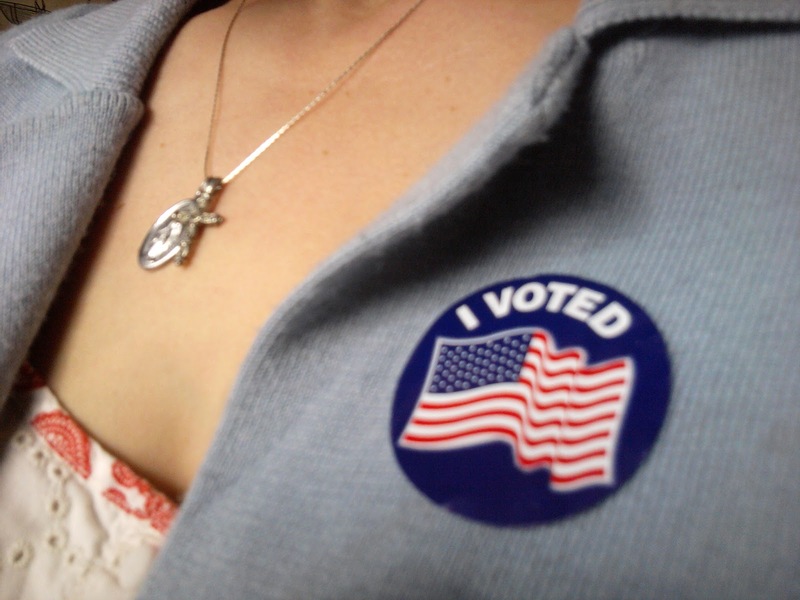 Did I mention I voted with three small children in tow? There was even a line! In East North Podunk Rural Michigan! Cray. But also awesome. Speaking of which, I have had this song stuck in my head since I woke up. You take it now! Pretend that was written eloquently, okay? The main photo for this t-shirt on Amazon made me laugh so hard yesterday morning. (Sorry if you're a fan on fb and are having to see these again, bee tee dub). "Workin' it in da club in my v-neck cotton tee, baby!" If you haven't seen this new bid-niss they're calling Auto-tune the Clergy, you MUST watch. And finally, this fierce *slash* adorable baby kicking the stuffing (literally) out of an uber evil dragon will MAKE YOUR DAY. WATCHITTHISINSTANT. Did you love it or did you LOVElove it? #8 made me cry! #10 made me spit-take my computer. When he says "perhaps I love you more..." and everyone bursts into cheers? Chills. Ditto. Tears. Needed that today, so badly. Definitely tears!!! Who woulda think auto tunes plus JPII can produce such emotion.. I saw the Dragon Baby yesterday on the Today Show. So cute! Imagine my pride in going to the polls with my 20 year old son so he could vote in his first presidential election! Great post, Dwija! You always make me smile! Hey, we have the same meal planning strategy! Here's the funny thing about #1, Dweej - I didn't go looking for that video, *it came to me* (cue mystical music) and of course I thought of you. It's as though the Hand of Destiny was guiding yet one more He-Man clip into your possession. You were *meant* to have it. Every time someone finds something ridiculous on the internet, they think of me. Should I be concerned? Ahhhh Perhaps I LOVE YOU MORE!!!! thank you for making my entire week! I LOVE LOVE LOVE the autotune. Oh, it made me cry! I miss him so much. I can't tell you how much I enjoyed this post. I mean I knew I liked you the minute I found another blogger in Michigan but then to see we share a similar sense of humor. I die. I can't stop watching JPII sing Dynamite. Amazing. That auto-tune makes me REALLY miss JPII! I remember feeling such a loss when he died, and ever since I strongly feel his presence in my life! I have loved living in Poland these past 2 years and witnessing how his life and message is such a big part of life there! He was truly a great man! I found the actual video from his visit to the Catholic University of America (the clips were used in the auto-tune)! So endearing!! He just loved the youth! #1 was AMAZING. #3 reminds me of Shaun the Sheep. Love it. #8 No words other than incredible. Needed that. #10 I laughed until I cried. Then I watched it again per the boy child's request. I have watched #10 3 times just today because of the kids! I love the video of "How Can I Keep from Singing?" -- it's one of my favorite hymns. #3 made me spit my tea up and snort, and #10 made me giggle and watch it 3 times. THANK YOU THANK YOU THANK YOU! We loved the autotuned Pope JPII. It definitely lifted me out of my post-election depression this morning. I am definitely going to download that mp3 and add it to our playlists! I think it makes a great worship anthem!! !